Economical Choice. The Davey BT14-30 Booster Pump System features a cut-out at low flow and cut-in at 80% of the cut-out pressure providing a constant, even pressure flow of water. The system also has automatic recognition of small pressure loss (RO, ice makers, etc.) to reduce needless cycling. Providing you with smooth, even pressure for showers, sprinklers and all your household water needs. NOTE: 100% Compatible with: Amtrol RP10, DuraMac 17035R, and Grundfos MQ3-35 Systems. Formerly known as HS12-40HT1. 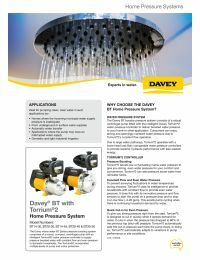 Davey BT14-30 Booster PumpAre you experiencing low water pressure issues? The Davey BT14-30 Booster Pump can solve your problems. The system will give you a stronger and even water pressure by boosting your exisisting pressurized water supply. You will no longer struggle with water pressure fluctuations when someone flushes a toilet or have low pressure in a bathroom faucet. Opposite to flow switch controllers that require a minimum flow before they will operate, Davey BT pumps will begin as soon as the faucet is opened and keeps running until the water is no longer needed. But that's not all! The Torrium 2 Pressure System Controller automatically adapts to changing conditions because it has a built-in 'brain' that can out smart every-day problems. This also means far less installation and maintenance issues. 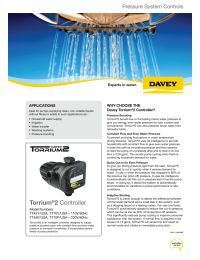 The Torrium2 ensures that a steady, reliable flow of water is available day after day, year after year. 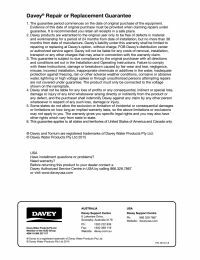 Davey products are warranted to the original user only to be free of defects in material and workmanship for a period of 12 months from date of installation, but no more than 24 months from date of manufacture.